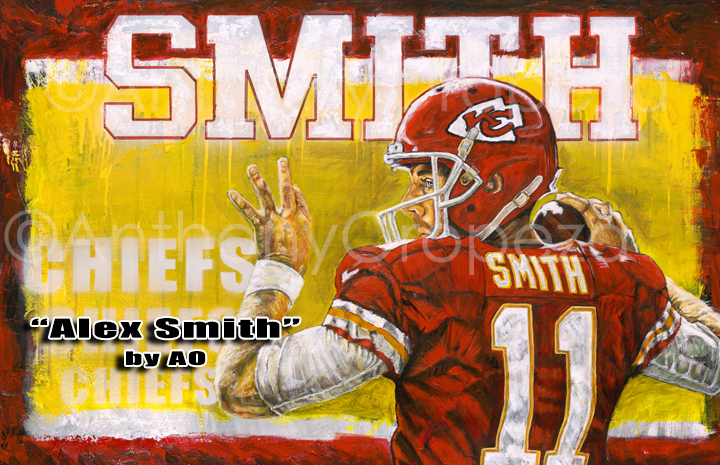 If you are an Alex Smith fan, a Kansas Chiefs fan, or simply a football fan, no one has to tell you how brightly Alex Smith’s star shined in the 2017-2018 season. In that season, Smith, without a doubt, out performed his previous two seasons with KC, and he out performed most of the NFL quarters in the league. And, it comes as no surprise that the home town artist Anthony “AO” Oropeza would celebrate his outstanding year with an original piece of art with him in action. Although AO has been painting mostly baseball players, Royals players to be more specific, he will never shy away from any or all opportunity or the inspiration of painting other sports figure. With the love for all sports, AO brings an excitement and a passion for realism to the moment. “A challenge to a piece like this is not only to make sure the player looks like the player, but to make sure there is a level of energy and focus on the player – and most importantly, that the viewer, fan, sports lover or not, sees it”, says AO. Oropeza’s “Smith” it just another example of is his artistic range and without a doubt, there is, and will be much more come. Order your prints soon by clicking on the size you desire below, or visit The AOART5 Store. Interested In Your Own Original? Interested in purchasing this piece or your own original of your favorite player, please contact the AOART5 Studio.